The ever-suave barista, Nevin, quietly approached my table this afternoon to check on my friends and me. 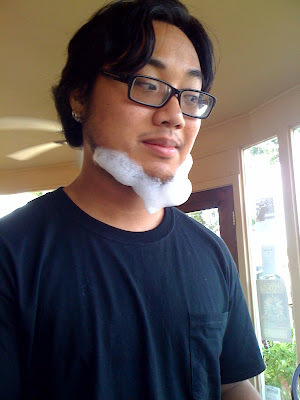 Our coffee was hot, the food was good, and his bubble-beard was...quite funny. The Oak Tree Bistro has been open for a year or so, and I can't recommend it enough. The staff is always very friendly (and entertaining.) My favorite eats are the hummus, served with toasted pita wedges, the greek salad, the cobb salad, and whatever the soupe du jour happens to be. Wonderful, wonderful food! I recommend getting the cobb salad with feta cheese instead of the blue, and having it served in a spinach wrap. The greek pizza and the buffalo chicken pizza are also very tasty. This is not your ordinary day job, and the Rikers are not your ordinary Arkansans! In 1989, David Riker (at left) decided to broaden his horizons after listening to a friend talk about his work experiences in Antarctica. Barbara, David's wife, knew nothing about David's intentions to head south. "He volunteered me," said Barbara. "He didn't even ask!" 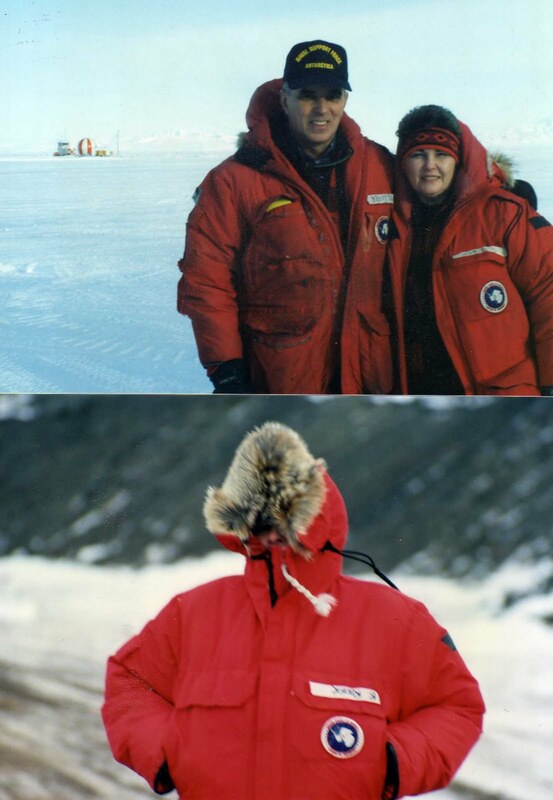 Top Photo: David and Barbara Riker in Antarctica in 1992. Bottom Photo: Barbara demonstrates the proper way to wear a parka. The Rikers traveled to McMurdo Station, an American research station on Ross Island in Antarctica. They found jobs with Antarctic Support Associates, who were contracted out to do work for the National Science Foundation. (Raytheon currently has the contract.) David was a materials foreman, and Barbara worked several different jobs during her three year stay on the icy continent. "There were 250 people stationed at McMurdo during the winter season," said Barbara, "and only 30 were women." Barbara celebrated her 50th birthday there, and she said she held the record for the "oldest woman" at McMurdo for a while. The Rikers were not allowed to share sleeping quarters, although they were married. "Living quarters were based on the job you had," explained Barbara. She spent her first year living in a large tent called a "Jamesway." There were actually ten tents set up together, and the living conditions were less than optimal. "It was awful," she said. "It was freezing." At times she would wake up with snow in her tent and black grit on her face from the volcano nearby. David and Barbara traveled through Christchurch, New Zealand, on their way to the Antarctic. They were each issued cold weather gear at Christchurch, "which included a myriad of inner and outer cold weather garment items, including two parkas, bunny boots, etc.," said David. "We wore one parka on Sundays, and the other to work," said Barbara. A Navy Chaplain was stationed at McMurdo during the summer months, but there was no hired minister on hand to give sermons during Antarctica's winter months. So David stepped up to the pulpit to replace the recorded sermons that were left as the Chaplain's substitute. The Rikers were apparently well-known for their discipline and dependability. While David gave sermons on the side, "I was everyone's mama," said Barbara. She often carried around bottles of Tylenol and Exedrin to dole out to workers suffering from hangovers. Drinking alcohol, not surprisingly, was a common pass-time at the station. Barbara remembers finding a man passed out in the cold and calling to get him help. "You had to take care of each other, no matter what," she said. Two men who went out hiking one day fell into a crevasse and died. Alcohol was probably involved in that tragedy. But Barbara also remembered lighter times, when people would grill out steaks in the freezing temperature. Once she saw a couple of naked men running around the outside of the building, after they had obviously lost at a game of "strip poker." They apologized to her and David during their next meeting. "After you've been there for 8 or 9 months in Antarctica, anything is funny," she said, shaking her head. David said he never felt scared or feared for his life during his 5 years at the station. "[It was] just cold," he said. "There wasn't any crime," Barbara added. She said that Antarctica would be a perfect place for a prison because "they can't go anywhere!" Times were especially tough for the Russian workers at another Antarctic research station. The Russian economy had collapsed, and their workers couldn't go home. "They were stuck there," said Barbara. The U.S. and New Zealand agreed to help pay for the workers to go home if the men could find a way over to the McMurdo station. "The U.S. allowed the Russian ship carrying their research workers to dock at McMurdo, where they received fuel from the U.S.," said David. Then they sailed on to New Zealand, "where they received additional assistance." While the Russians were still docked at McMurdo, "they sold some of their personal belongings to obtain U.S. dollars," said David. "One guy sold enough stuff to feed his family for two years," said Barbara. She purchased a painting and a few other items from the men, wanting to help out. David was one of the few people who went running at night for exercise during the winter months. He said one of the reasons he did it was to look at the stars. "There's no air pollution down there," explained Barbara. There were also nacreous clouds that shimmered like pearls. "Pictures aren't good enough," she said. "They don't really show you what they look like." Barbara also seemed to enjoy watching the local wildlife. She would stand on the sea ice edge, and whales would sometimes surprise her by surfacing so close to her. "The only warning you would get is the ice moving under your feet," she said. She often watched the penguins play in the water. The Rikers aren't hesitant to recommend a trip to Antarctica. "If you get the opportunity to go, do it," said David. "There's a saying about people who go down there," said Barbara. "The first year, you go for the adventure. The second year, you go for the money. The third year, you go because you don't fit in anywhere else!" 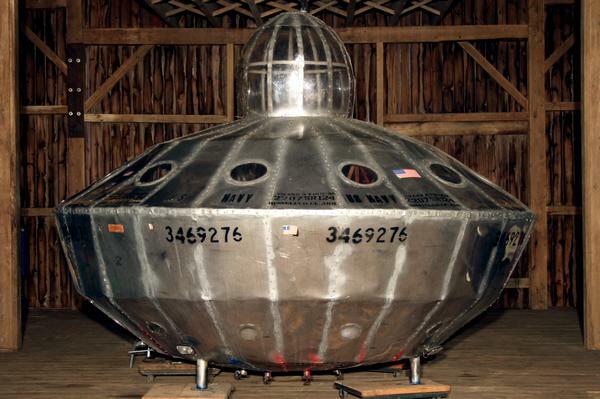 Local WWII veteran and mechanic Frank "Al" Thomas built this metallic beauty back in the 60s. Friends of Al's in Russellville, Arkansas, say that he intended to fly it, although no one ever saw him try. It was approximately 12 feet in diameter, and at least nine feet tall. There was a seat perched in the bubble for the pilot. "Exploding electricity" was the method of propulsion. My friend Kevin Barber knew Al, and said he enjoyed spending time in Al's shop with him. 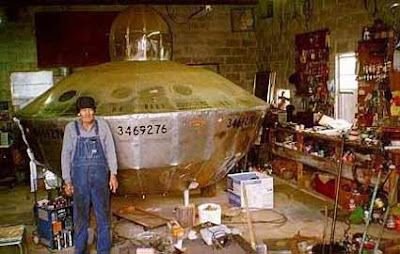 Al passed away several years ago, and his spaceship is rumored to be on display at a museum up north. Al Thomas in his shop. Russellville, AR.